1. Put ½ tbsp olive oil in a frying pan with the lardons and garlic. Place over a low-medium heat and cook slowly for 5-7 minutes, until the lardons are golden and crisp. Remove the garlic clove and discard. 2. Add the vinegar to the pan and bubble to reduce slightly. Remove from the heat and stir in the chives and remaining oil. Season with black pepper. 3. 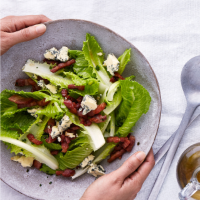 Arrange the lettuce leaves in a serving bowl and scatter over the stilton. Spoon the hot dressing over the salad and eat immediately, before the dressing cools. This recipe was first published in Thu Jun 01 11:32:00 BST 2017.